The grin and enthusiasm are a constant! Suzie Cooney, CPT, lives her expertise! It was almost a year ago that Ed and I had the chance to meet a virtual whirlwind of expertise and energy, Suzie Cooney (CPT) of Suzie Trains Maui. We tentatively tested the waters of the Olukai Ho’olaule’a by doing the “fun race” of three short miles and emerged from the water wanting only MORE! We knew that there was no way our “almost-ready-for-Medicare” bodies were trained for the wind and waves of the full run from Maliko Gulch, so we stayed in touch with Suzie. Great plan! You too can enjoy her training no matter where you live via a SKYPE session or you can enhance your Maui vacation paddling by booking a local session. Be sure to plan well in advance. Suzie works hard sharing her training and expertise from large group workshops, articles and private sessions. Being among the tribe of “Wounded Warriors” now and then, we were delighted to discover solid advice on the Suzie Trains Maui website and on the Naish surfing website. We are most recently doing some interesting core work that’s fun and challenging. We want to be ready when we grab our Naish Glides and Mana series surfboards in 63 short days. Yes, drooling can commence when you see the image (below). The Glide and Mana series are calling my name! 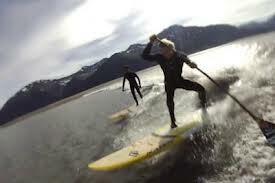 Over the winter months we have been training with TRX and the Indo Board. Guided by Suzie’s video and e-mail support we make progress. Since we’re rarely actually out having great fun standup paddling these last months (but the skiing has been great) the most important part of Suzie’s connection with us is an unabashed love of the ocean, the wind, the waves and the glides! We can easily use the GoPro HERO to film segments of our technique, then have a variety of people give us input. Editing clips of GoPro footage is easy – easy to edit and easy to share. Suzie’s regular e-mail updates and blog articles are almost as good as being there. Yes, we wanted to be there when she paddled with whales. No, we didn’t want to be there when a large north shore winter wave smacked her onto a reef (yes, there was some blood). Through it all, enthusiasm reigns! For a huge part of the world October delivers astounding Fall colors and freezing nights. Unless the palm trees are waving in the breeze where you live, unless you bundle up in neoprene booties, your SUP days are more challenging this time of year. This is exactly the time of year to be thinking this way. Fitness is an illusive sports partner – now you have it… and (way too soon) now you don’t. A great resource can be found at your local Naish SUP retailer. Often there is a fitness professional available to provide some solid off season training. We have learned quite a bit from Christian Cook at NRG Salt in Madeira, FL. He’s got a great philosophy about SUP training – get your training on the board or through in-the-gym sessions that mimic the flow and smoothness of SUP. 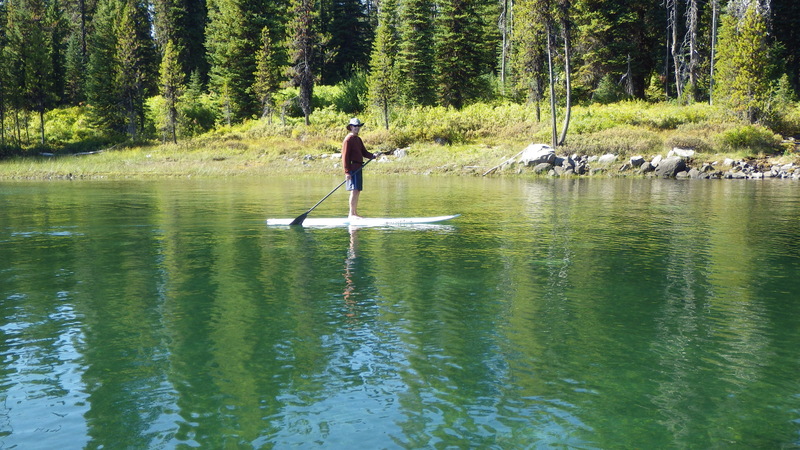 He’s always looking for ways to grab a few fitness (strength, flexibility and balance) moments during a paddle. The last time I paddled with Christian we were grabbing the sides of docks as we passed under them and doing a few pull-ups as we cruised by. Cool factor: not 3 minutes later a huge bottle-nose dolphin rolled across our bow wake. That’s Tampa Bay for you! We have been fortunate to find Suzie Cooney, CPT of Suzie Trains Maui and a Naish team rider– 3000 miles across the Pacific Ocean from us, but as close as a quick SKYPE call. A free SKYPE account and a computer with video capability is all you need for a distance training session. Once you contact Suzie you’ll discover many ways she can enhance your fitness and SUP performance on the water. How do you train? What’s your favorite off-the-water fitness routine? Have you got some shoulder, back or core exercise that have helped you rehab after an injury – or remain injury-free? 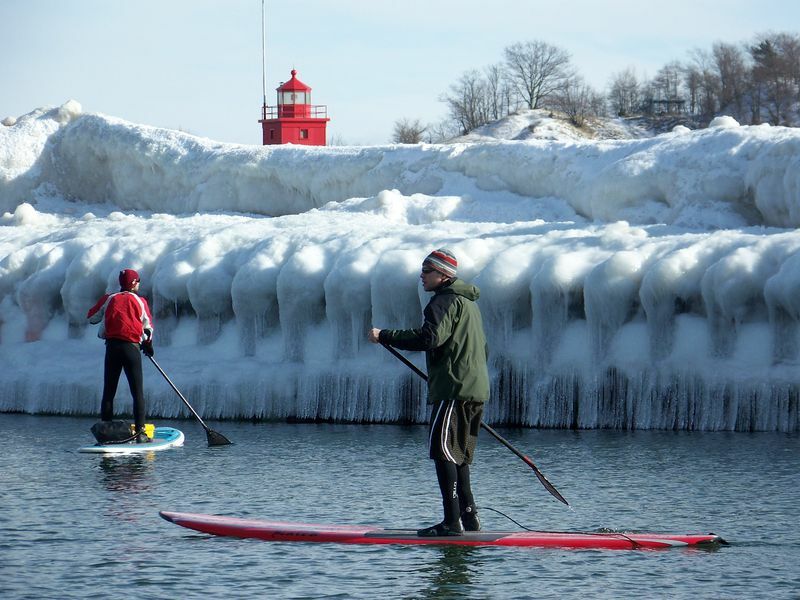 Let us know what inspires your off-season off-water workouts. Pockets of pain during specific training can make you “hurt so bad” and soon feel so good, according to trainer Suzie Cooney. With a great blend of physiology, expertise – and some humor – Suzie shares a great training session that can re set the muscles used in SUP. You can watch the video here – better yet, view it on Suzie Trains Maui’s website for this video and MORE! All summer long I have been paddling about 5 days a week but feeling a bit bad about all the fun. My husband, Ed, had a summer doing PT for rotator cuff repair, Lifting a 1 lb weight and pulling a red TheraBand just didn’t equate to fun. 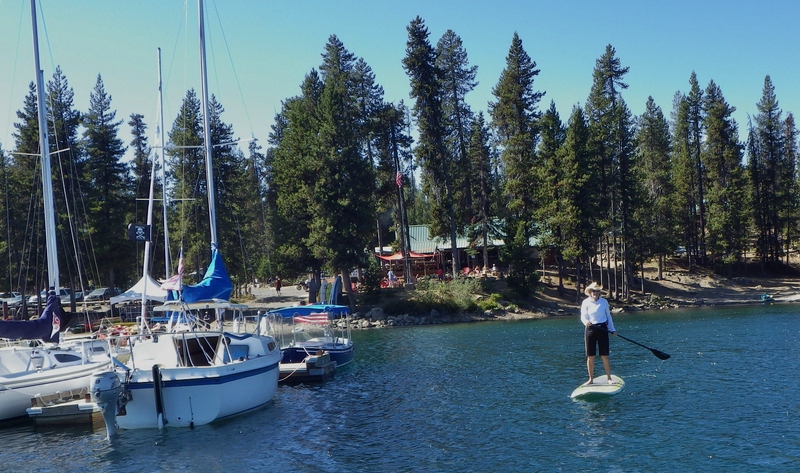 While staying in cardio shape hiking the incredible trails and peaks are Central Oregon has been terrific, we prefer our water sports. Last Saturday he got the okay to get on his board – but “take it easy,” said surgeon Cara Walther. The spectacular first day of fall weather agreed with a casual cruise with friends up at Elk Lake. Since Ed will be training under the expertise of Suzie Cooney (Suzie Trains Maui, a Naish team rider– you can too, just set up your Skype training – left column on her blog) he decided to give the shoulder a nice long warm up. After that, he paddled along the shoreline observing which muscles seemed to be engaged – abs and lats more than the shoulder. Balancing on the board on the lake seemed easier than balancing on the Indo board that he plans to use this upcoming week. Why did we get an Indo Board? Some training examples using the Indo board can be found on Suzie Cooney’s website. According to information we found online, “Indo Board Balance Trainers are the most effective land-based means of training for SUP racing, SUP surfing and Stand Up Paddle Board Yoga. Standing on an Indo Board simulates the instability that a rider experiences when riding a stand up paddle board and allows for repetitious functional exercises that directly enhance the user’s abilities.” With cooler weather and snow on the horizon for the next 6 months, that’s going to be a fine addition to our training mix. You just can’t get enough core strength and balance. Another important thing we celebrated while paddling on Saturday was the one year anniversary since our good friend, Rick, was surprised by a sudden stroke. Fit, healthy and active, that health incident came as a complete shock to Rick. Perhaps his good health gave him the start point for full recovery and the ability to resume standup paddling with all the confidence he’d had before. All four of us have been more aware than ever of the need to stay focused on an exercise program that includes cardio, balance, flexibility and strength. Now that we’re heading to our mid-60’s we’ve got a lot of inspiration to keep the active fun a central part of how we live.